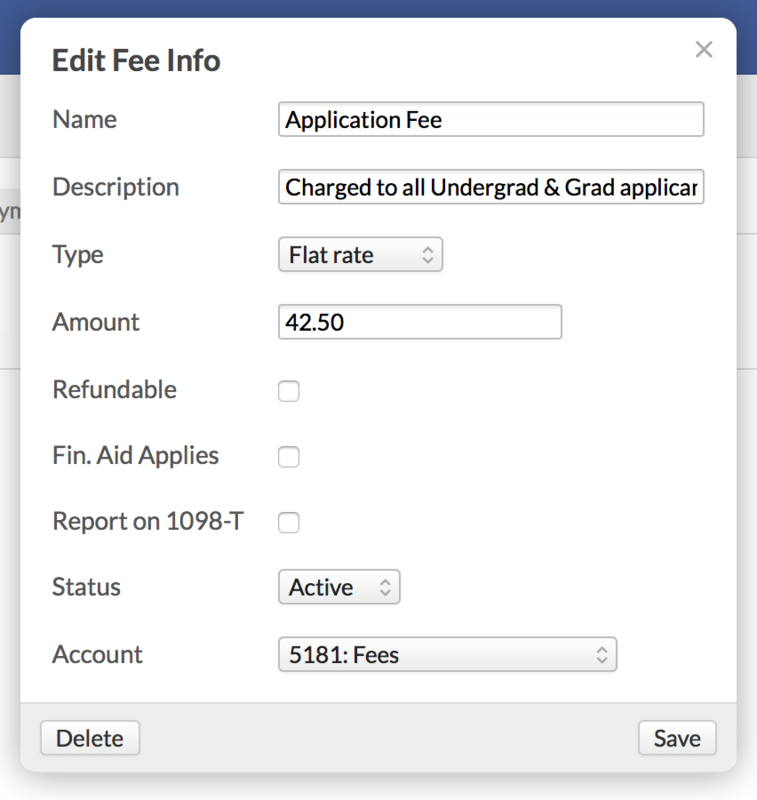 Here's how to set up and receive payment for an application fee. A Financial Admin user can set up the fee for you in Financial > Billing > Settings. Once it's set up, you can attach it to individual applications in each application's settings. Applicants can pay when they start the application or when they submit it. You can also choose to waive the fee on a case-by-case basis. Ask a Financial Admin user to set up the Application Fee in Financial > Billing > Settings > Fees. After the fee is created, you can add it to as many application forms as you wish. Go to In Admissions > Settings > Application Forms and select the application to which you want to attach this fee. In the application's settings, click Fee. Select the fee from the drop-down. You'll be able to select from any of your school's fees, so make sure you pick the correct one! Enter or change the fee amount. Applicants workin on this application will pay this amount. You can use the same fee on another application and charge a different amount there. Select when you want to require the fee's payment: when the applicant starts the application or before the applicant submits it. When an applicant pays the fee, you can arrange to have a notification sent to anyone who needs to know. Go to Admissions > Settings > Other Settings and enter email addresses for those who should receive such notifications. Make sure to separate multiple email addresses with commas. These people will receive a notification every time anyone pays any application fee. When a lead starts an application: When online applicants fill out the initial form, they'll be asked for credit card information. They won't be able to submit the form until they've paid the fee. When you start the application for a lead: When you add the application to the Lead yourself, you'll have four options for the application fee: credit card, cash, check, and waive fee. Waive fee, of course, lets the applicant progress through the application without having to pay the fee. The Lead pays: Before the applicant can submit the application, they'll be asked for credit card information. Only after paying the fee (and completing the required fields) will they be able to submit the application. You record the payment: On the application's page, you'll see whether or not the fee is Unpaid. If so, click Enter payment; you'll have the same four options as described above.